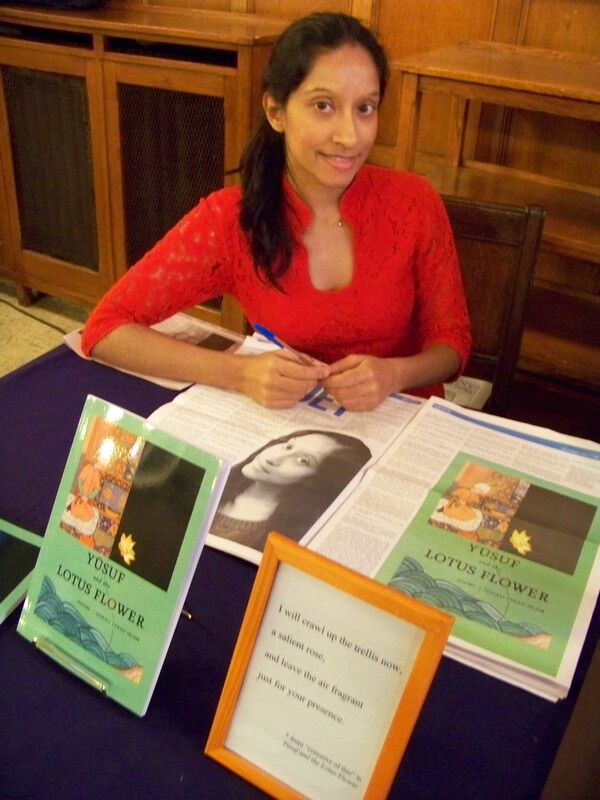 Doyali Farah Islam offers Yusuf and the Lotus Flower as her first collection of poetry. She is the first-place winner of Contemporary Verse 2‘s 35th Anniversary Contest, and her poems appear in Grain Magazine (38.2), amongst other places. Born to Bangladeshi parents, Islam grew up in Toronto, Canada, and spent four years abroad in London, England. Currently, she is completing her undergraduate degree at the University of Toronto (Victoria College), where she pursues a double major in English and Equity Studies. DFI: It was never a rational decision to choose poetry – more of an impulse that I first felt at the age of seven or eight. However, the intensity of the form is highly attractive. Poetry also gives me a meaningful way to serve. DFI: Unless I’m working to a deadline, I write and edit when I feel like it – usually in long stretches during which I forget or forgo food and/or sleep. Once I start working on a piece, the creative process feels like a focussed frenzy or a fervour (enjoy my alliteration). I feel compelled to sit and edit until the piece is exactly the way I want it, or until it is the best that I can make it before exhaustion hits. I keep all of my drafts. DFI: Nineteen years. The first poem I wrote was in Grade Three, and it was called A Poem About Birds. I still have it, and it makes me laugh – the huge typeface, the computer paper with the tear-off strips running down the sides. I remember feeling inspired, sitting down in the classroom at one of those early-nineties word processors, and writing the poem in one go. Given my response to the question above, I guess the essence of my process hasn’t changed! 7) Dr. Rod Michalko: I took a course of his (NEW241Y1: Introduction to Disability Studies) at the University of Toronto, and his lectures and assignments made me become, for the first time, attentive to the language/discourse of normalcy that operates in, is produced in, and is reproduced by our society. I did the best I could to edit the manuscript of Yusuf and the Lotus Flower so that it did not reify such language/discourse. Both my editing process and my book of poetry show that even if writers do not call openly for social justice, their writing can be informed by a desire to transform society. Furthermore, even if artists do not want to or cannot call openly for socio-political change, they can wield language to rupture, in a non-violent way, dominant discourses and to (re-)imagine or even (re)create society. What is present in one’s poetry/writing/art is as important as what is absent. It’s up to the reader and/or listener to notice or puzzle out the absences; and all absence is presence. BCP: Your poetry is spiritual. What do you try to convey to your readers? DFI: The poems were, at first, never intended for other readers or listeners. I wrote them because I felt compelled to write them, and because both the process of writing and the final products helped to carry me through difficult life experiences and emotions and to record my own moments of clarity, joy, and peace. I wanted to be able to call myself back to these moments – and to call myself back to what I believed and still believe to be the best capacities of humanity and the best qualities of our temporary world: capacities for trust, loyalty, beauty, sincerity, courage, resilience, compassion, understanding, open-mindedness, and love. I realized eventually that the poems might benefit other human beings or at least give them something to (re)consider, and that this benefit could never be a possibility unless I shared my work. 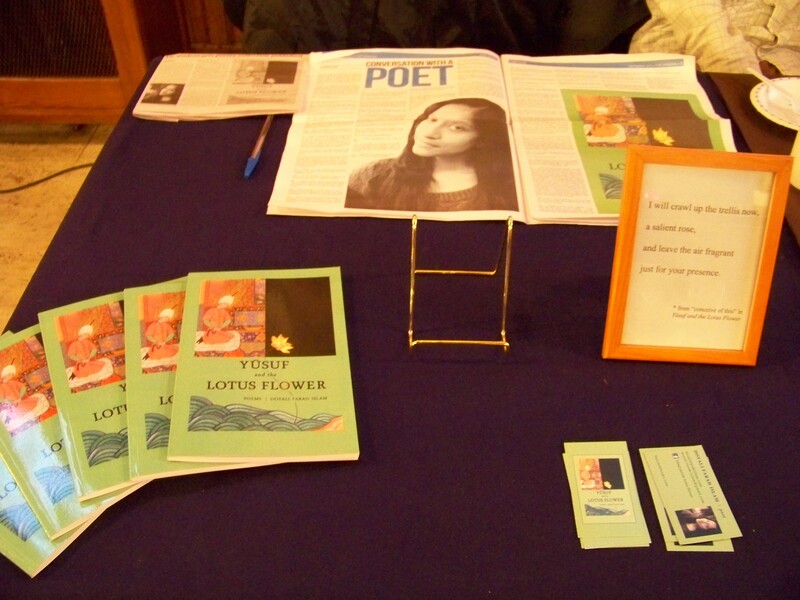 Thus, I decided to offer up my verses formally by pursuing publication. It might not even matter what exactly I was trying to convey. Hopefully, the general sentiment of the poetry comes across as a sense impression. Furthermore – and undoubtedly – every individual will bring a unique set of experiences, thoughts, emotions, and insights to bear on the work. I do recognize and hope that I conveyed that my understanding and practice of Islam is just one of many. Surely, there are basic beliefs that all Muslims should hopefully agree to – namely, that the Divine is One, that there are angels; that there are sacred books; that there are messengers; that there is a Day of Judgement; that there is “supremacy of Divine Will” (Sarwar 18); and that there is “life after death” (18). However, the religion of Islam as it is practiced by over 1.6 billion Muslims worldwide is undoubtedly not a static or monolithic thing. It encompasses variegated and ever-changing beliefs and practices. BCP: How long were you working on the poems that are featured in Yusuf and the Lotus Flower? DFI: One full year to write, and another full year to edit. However, the personal experiences, observations, and small insights that manifested themselves in the poetry came out of several years (approximately five or six) of another kind of work – that necessary spirit work of listening to my inner consciousness and, subsequently, taking the necessary actions – that is, making the necessary changes in daily life. This kind of spirit work (my own term) entailed feeling acutely such emotions as grief, longing, despair, rage, and anxiety. I allowed these emotions to lead me to greater understanding and compassion. If one is not active outside of one’s writing, one cannot writing anything interesting or of meaning. The beauty is that everybody is doing something – even if just imagining. It is equally truthful to say that it took the whole of my lifetime up to this point to produce Yusuf and the Lotus Flower. Then again, for me, it is also as truthful to say that, while I did the work of writing and editing, the Divine who has infinite names was the ultimate Worker. BCP: In your “Final Thoughts” section your first sentence starts off with, “In a post-9/ 11 world…” Was it difficult finding a publisher as a Muslim poet who also writes from a Yogic influence? DFI: It was difficult to find a publisher period, given that I was an unestablished poet with virtually no publishing history. BCP: Many writers choose publishers that they feel might understand and support their work more than other publishers. For example, many Aboriginal publishers I know choose Aboriginal publishers. Your publisher is not one that specializes in Islamic or Yogic writing. Did you approach Islamic or Yogic publishers? What that important to you? How was it working with a non-Islamic and non-Yogic publisher? DFI: My first priority was to find a publisher in Canada, since I figured that if presses in my own country weren’t interested in my work, presses abroad had no reason to be. While I did search for Islamic publishers, I couldn’t find any in Canada, and I was doubtful that, even if there were any, they would be interested in contemporary poetry from a new voice. I also wasn’t sure how my interfaith – or, more accurately, interspiritual (my own term) – approach would come across. When I was travelling in Turkey, I met a painter in Istanbul who told me that Muslims have no need for practicing yoga because they have their Islamic prayers. I respect his opinion and recognize that many Muslims probably feel the same way as he does, and I realize that even if he doesn’t practice yoga/yogic meditation himself, he probably respects those of other faith traditions who do. However, I was a little taken aback by his position. For me, artists, of all people, are in the best position to cross boundaries, to notice similarities, to make fluid things that are rigid, and to set in motion things that are static. In the end, I was fortunate to find a Canadian publisher who did not want to mess around with my spiritual and inclusive vision. My publisher was, however, surprised that the poetry came from someone so young! Now that I think about it, it was probably easier to work with a press that had no spiritual/faith mandate than with an expressly-Islamic or yogic (if such a thing exists) publisher that had its own particular beliefs about what Islam and/or yoga is. BCP: Has writing helped your spirituality or vice versa? I recite my verses, as well as the verses of other writers, aloud to myself as I walk home. It’s not arrogance. The fact that I still need to hear and heed my own verses is very humbling. BCP: The cover of the book is beautiful. Can you talk about it a bit? DFI: I designed the cover myself, but it took several people working together to execute the vision – namely, my sister, the Smithsonian Institution, and an old friend. My sister, Laboni, drew the golden lotus flower in pencil crayon, and she also depicted the water and shore in a watercolour medium called gouache. The image in the top-left corner is cropped from a painting called Yusuf Entertains at Court Before His Marriage by a fifteenth-century Persian mystic, artist, and poet named Jami. The Freer Gallery of Art at the Smithsonian Institution gave me permission to use the painting, which is part of Jami’s Haft Awrang (Seven Thrones), a work with seven sub-books. (Interestingly, I also divided my poetry book into seven parts, but the choice was based on Yogi Bhajan’s Seven Steps to Happiness. Also interestingly, Jami writes in his work a poem about Yusuf and Zulaykha, but I have yet to read a translation of the poem. I might do so, now that I don’t need to be fearful of inadvertently plagiarizing his work.) When it was time to design my book cover, I searched the internet and looked through three books on Persian painting until I came across a depiction of the Islamic messenger and Judeo-Christian figure Yusuf (Joseph) that felt like the right one. I loved the description of the painting by the editor of that book. I also noticed and loved the details of Jami’s particular depiction of Yusuf. The white turban with the stick-like thing coming out of the top represents, for me, Yusuf’s consciousness of the vertical axis/dimension within human life. That is, it represents, for me, Yusuf’s connection to the Divine. Furthermore, the white turban reminds me of other spiritual traditions in which humans cover their heads – for example, Sikhism and Kundalini yoga. If you look carefully at my cover, you might also notice a black or brown dot on Yusuf’s cheek, as well as a lock of stray hair that falls on his shoulder. Both details suggest to me that Jami was definitely working within a framework of Sufi symbolism – the dot representing what John Baldock calls “the Unity of Knowledge” (79). It’s also interesting to me that the word kundal, in which the name Kundalini Yoga originates, means “the curl of the hair of the beloved” (Bhajan 21). !!! Is that not absolutely amazing? In the top-right corner of the cover, the golden lotus flower that rises out of shallow waters and that is set against a black backdrop symbolizes courage, hope, beauty, enlightenment, and peace within or despite despair. Jami’s painting on my cover further encapsulates perfectly for me some other aspects of Islamic and yogic practice: the meditation/prayer on a mat that is placed on flat and clean ground; and the tranquil and focussed disposition of the human who is engaged in that act of meditation/prayer. Prior to the selection of this image, however, I actually went through a huge inward dilemma about whether or not I should include a visual representation of a messenger of Islam on my book cover. I wanted to be respectful of the fact that Islam does not support iconography, but at the same time I felt that the cover would look imbalanced if I had a visual representation of the lotus but no visual representation of the figure of Joseph. I don’t know if I made the right decision, but the response to the cover has been so positive that I am content with it. 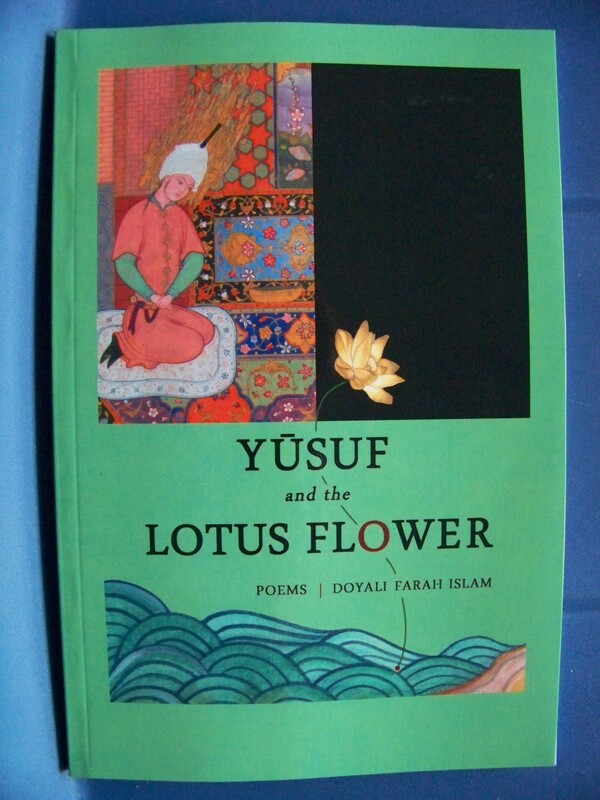 The cover of Yusuf and the Lotus Flower is a composite, both in terms of artistic endeavours and artistic media. The composite nature of the cover matches my appreciation of and hope for unity and harmony amidst diverse spiritual traditions and ways of living. My friend, Patrick Soo, assembled all of the elements for me in the way that I wanted them. I didn’t have the technological skills for that! BCP: What advice do you have for young poets shopping around their manuscript? 1) My first piece of advice relates, curiously enough, to the story of Yusuf (Joseph): Have patience. Have patience while editing your manuscript before you send it out, and have patience when waiting for a response once you’ve sent it out. 2) Believe in your work, your own inner knowledge, and your own way of conveying that knowledge. Poets are highly sensitive beings but they (must learn to) have tough skins. This sensitivity helps us to write fiercely, but it can also overwhelm us in the form of despair and stop us from progressing and taking risks. No matter how experienced or confident a writer is, rejection isn’t easy. In such times of dejection or – let’s be honest, despair – sit with your self and (re)call to mind the reason(s) for which you initially wrote your manuscript. Perhaps the only reason you had was love. That is enough. 3) Third, be selective in sending out your manuscript. Don’t just send it out to every random publisher you come across and hope for an offer. Browse websites of small presses and see if your manuscript fits into their collection, and be respectful of their submission guidelines. 4) Ask yourself why you want to make your manuscript public. Reflect on your goals. What do you want to accomplish? There are benefits and drawbacks to both self- publishing and publishing with a press. Pursue what suits you best. 5) Realize also that publishing is most likely a labour of love for small presses. Ultimately, however, it is usually also a business. Once you sign a contract, there’s no going back. This fact holds both parties legally accountable to the terms of the contract. 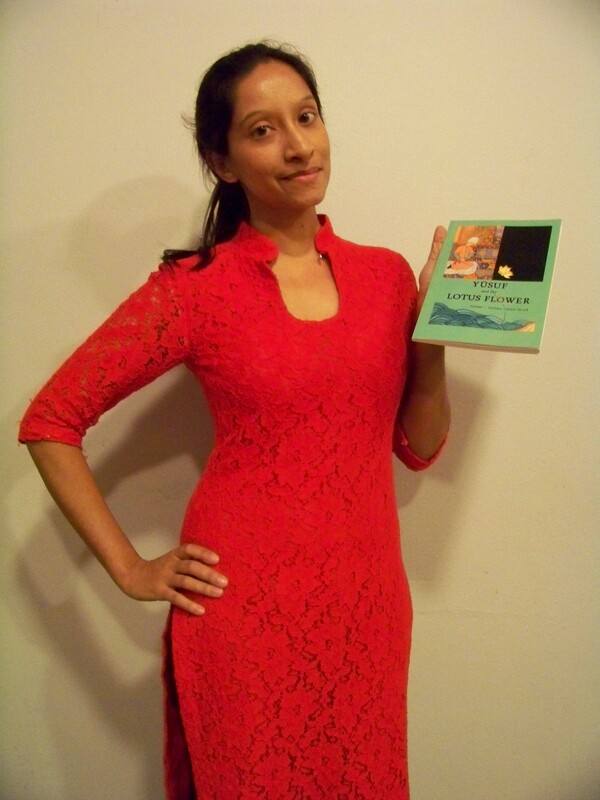 Tune into Black Coffee Poet Friday January 13, 2012 for a video of Doyali Farah Islam reading her poetry. This entry was posted in Poetry and tagged "I Have Been" by Doyali Farah Islam, "Seven Steps To Happiness" by Yogi Bhajan, "Yusuf and the Lotus Flower" by Doyali Farah Islam, "Yusuf and Zulaykha" by Jami, "Yusuf Entertains At Court Before His Marriage", Bangladesh poetry, Bangladseshi poet, Black Coffee Poet, Contemporary Verse 2, Derek Walcott, Doyali Farah Islam, Grain Magazine, https://blackcoffeepoet.com/, Interview with Doyali Farah Islam, Islamic poetry, Kundalini Yoga, Muslim poetry, Publication advice from Doyali Farah Islam, Rumi, Shopping around a manuscript, Woman of Colour poetry, Yoga poetry, Yogi poet, Yogic poetry. Bookmark the permalink.